1. Spending an afternoon in Home Depot? 2. Being trapped in a group text? We found ourselves in Home Depot not by choice. We needed a new window. I will spare you the boring details because really, all you need to know is that our current living room window is made out of tissue paper and we’re going to freeze to death. But window shopping is not like buying milk. Then, my phone starts rattling. I dig through all the crap in my bag to find 38 missed text messages. What happened next is a blur. I thought about Christmas and homemade gifts. 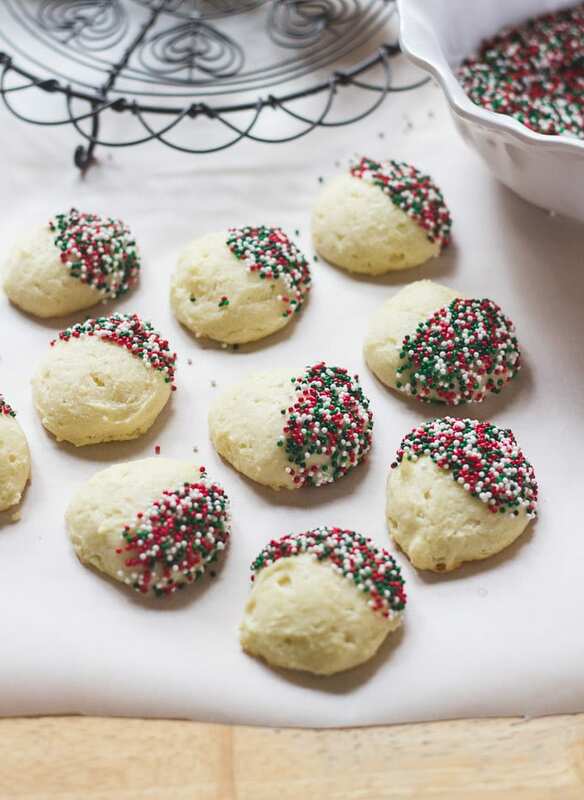 Ricotta cookies are classic this time of year and always on my baking list. They’re soft, sweet and dance along the lines of cookies and cake. Madame Editor’s mom makes the best ones but I’m forbidden to publish the recipe. It’s a family secret. Fiori di sicilia is an incredibly fragrant extract with hints of orange, lemon, and vanilla. It’s also very strong. You only need a drop. The taste and smell will transport you to a box of sweet Italian pastries. It’s beautiful. 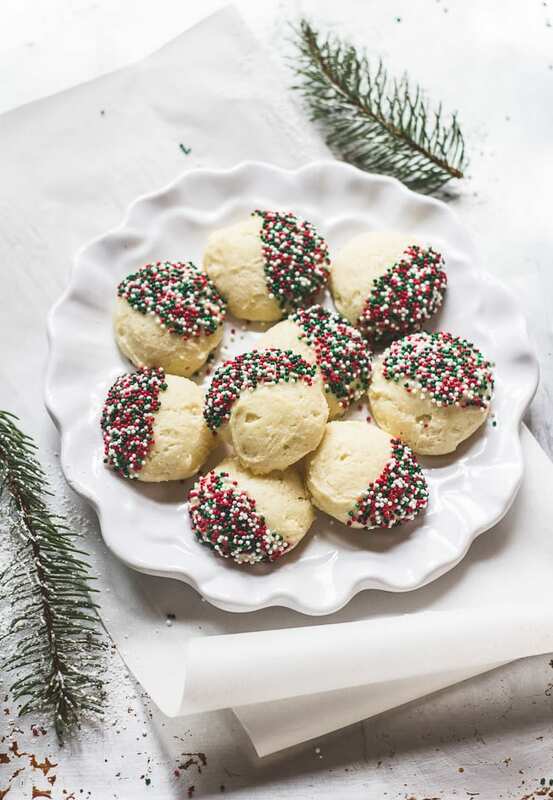 Although I’ve made changes to the coveted original, these ricotta cookies maintain their integrity with a soft center and delicate flavor. I challenge you to eat just one! With regards to decorating, I never go crazy with my appliqué. I’m not good at it. These cookies are simply dipped into glaze and topped with sprinkles. * To quickly soften butter, microwave for 10+ seconds adjusting the time as needed. ** You can order Fiori di Sicilia extract online through King Arthur Flour and Amazon, or purchase at Sur La Table or Italian specialty shops. Substitute with 1 tsp. of pure vanilla extract or ½ tsp. almond extract if you prefer. Preheat your oven to 325 F. Line a rimmed baking sheet with parchment paper. In the bowl of a stand mixer add the softened butter, sugar, and egg. Beat until light and fluffy. Add the ricotta cheese and extract. Mix well to combine. In a separate bowl sift the flour, baking powder, and salt together. With the mixer on low speed, slowly add the dry ingredients. Mix only until combined. 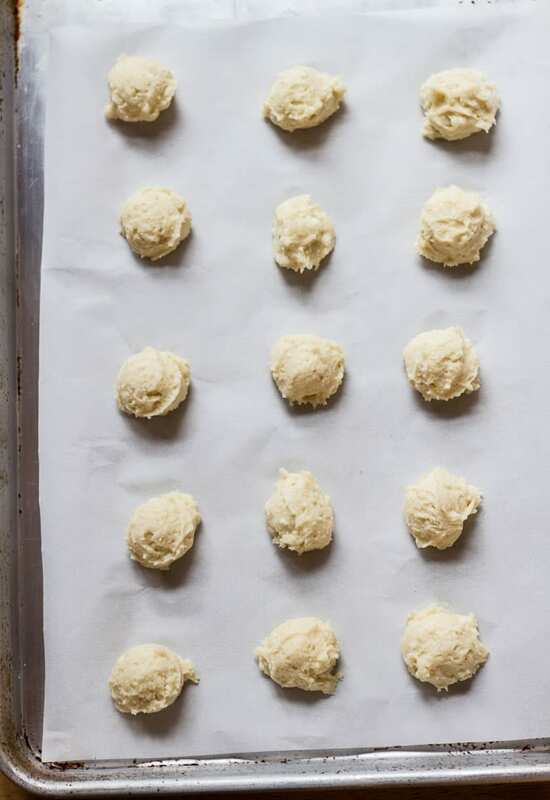 Portion the dough onto the prepared baking sheet using a cookie scoop. Bake in the center of the oven for about 25 minutes. Note: I prefer to bake my cookies one pan at a time. Repeat this process when the first batch is done. Remove from the oven and transfer cookies to a wire rack. Cool completely before decorating. 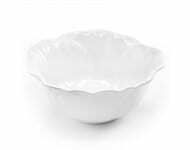 To make the glaze, sift the powdered sugar into a large bowl. Add the milk, 1 tablespoon at a time, until a glaze has formed. Set up your decoration station: grab 2 bowls and cut a long piece of parchment paper. 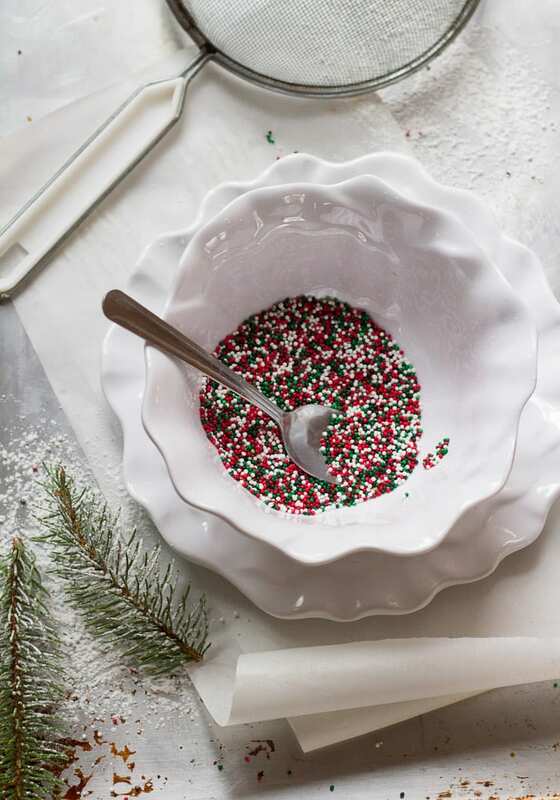 One bowl is for the sprinkles and the other bowl will remain empty ( to catch the sprinkles as you decorate). Place the parchment paper on the table for the glazed cookies to dry. To decorate, dunk ½ of each cookie into the glaze, allowing the excess to drip off. Working over your empty bowl, top the glazed half with sprinkles. Do not dunk the cookies into the sprinkles; the glaze will fall off and the sprinkles will get wet. Place the decorated cookies onto the parchment paper. Dry completely before serving. * If you'd like to make these cookies in advance, I recommend baking only 1 day head of time. They become softer as they sit. Store in an air tight container. My home decor friends, Q Squared NYC have a generous gift set to giveaway. One lucky winner will receive 2 pieces from the whimsical Peony Collection; a large serving platter and matching serving bowl. Their collections are BPA free and great for entertaining- they don’t break! Plus, they’re super pretty. Click on the images for more details. To enter the giveaway, fill out the entry box below! And if you’d like, tell me your favorite holiday cookie in the comments. Good luck! These cookies look amazing, I’ll have to add them to my holiday cookie tray. As for the draft in your living room, I recommend you leave the house this weekend. Maybe a quick trip up north would be good for you and the boys!!!!!!! Eeks! I def feel your pain. Looks like you had quite a stimulating and relevant conversation with the “helper.” I love the healthier adaptation you made. These cookies look so soft and fluffy! Sprinkles or not, I know I can’t stop at just one! Hi Min! So happy to see you here ;) Yes, relevant conversation indeed. When he asked whether we needed a ‘buck’ or ‘nail in’ window (don’t ask) that’s when I just zoned out. The poinsettias in the background might’ve had something to do with it… At least we got some cookie inspiration from this dreaded experience. And they really are soft and fluffy. Enjoy! I am seriously so in love with these cookies!!! They are fantastic! So festive and gorgeous! I know these need to go on my christmas cookie list! pinned! Welcome Tori! 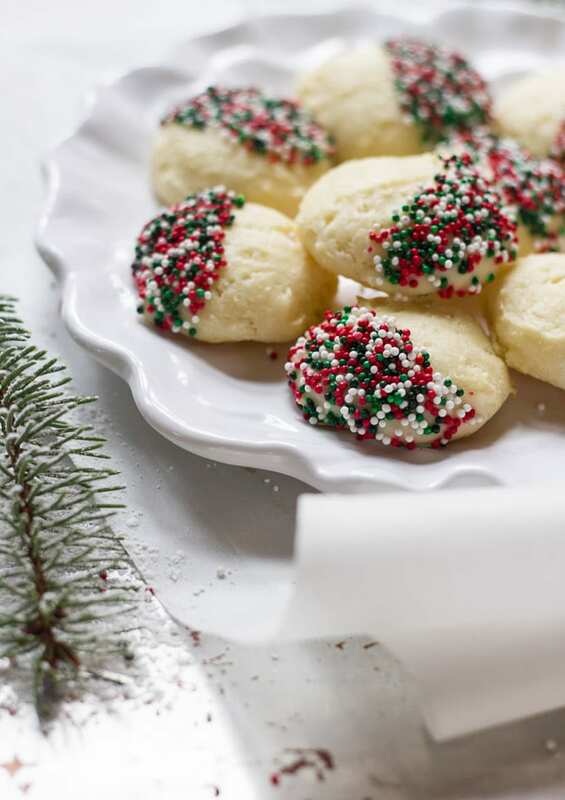 These cookies will make a festive addition to any holiday cookie platter. For best results, make them 1 day in advance. Have fun with the recipe and thanks for pinning! What a lovely recipe. Very easy to make. I think I have the office gifts sorted for christmas! Goodness, I would love to win !!! But, we’ve already won with your brilliant recipe. Anything ITALIAN has me. And, I’m not at all a cook, but I’m gonna make these and give some to everyone I know. Delightful X10, and so is your blog. Yours are good and I really love shortbread cookies. Thanks for the nice giveaway chance to win. What great looking cookies. I am sorry to hear about your window, and the black hole of the texting trap. You will love your new window – no more drafts! And I bet it will be quieter. As for my favorite Christmas cookie. That’s difficult. Let’s say Calzoncelli! I just adore Fiori di Sicilia. I have used it for many years, and there is nothing else like it. You are so right about using just a bit. I have seen recipes that call for your same amount of flour, but 1-2 TABLESPOONS of Fiori di Sicilia. Can you imagine? That would be enough (literally) to put someone off the stuff forever. So sorry for your window and unfortunate time spent at Home Depot. I avoid Home Depot at all costs, but sometimes, you just gotta go (not that I don’t like HD, it’s just the whole warehouse thing… just too big and we always end up spending way too much time there!). Is your window fixed? It’s wayy to cold to go without one! I still don’t know what’s worse… caught up in a group text or HD….. LOL! Emilie, these cookies are lovely and I think the sprinkles are a good idea too! Festive on these demure, but not plain, cookies! Sounds like I need some Fiori di sicilia; where can I get my hands on some? Thank you for your recipe and this lovely giveaway! Oh my! My favorite Christmas cookie is the decorated sugar cookie. They are such perfection! These look really special, I’m definitely going to add them to my list of cookies to make. I’m ever partial to the chocolate crackles – the rich chocolatey ones that are dipped in powdered sugar – but I also love a good chocolate chip cookie with crushed candy canes. But really, it’s hard to go wrong with a cookie. got a good chuckle from this post! haha! gorgeous cookies! very intrigued by the fiori di sicilia extract! sounds amazing! Thanks Donna! Fiori di Sicilia is very special. It really enhances your baked goods giving it that Italian flare. Not to mention is smells divine :) If you’re interested, I’ve amended the recipe to include where to purchase the extract. Happy baking! My favorite cookie are the Butter Ball Cookies with nuts. I’m obsessed with ricotta—can’t wait to try these! These look so festive, and they sound delicious … I’m so curious about the fiori de sicilia flavouring too! It sounds beautiful. My favourite Christmas cookie was always my mother’s shortbread – they were so buttery and it was much too easy to eat a dozen haha… another favourite are peanut butter balls (I think other people call them “Buckeyes”). I haven’t really tried my hand at gluten free and dairy-free Christmas cookies but this might be the year to start! Also – I really feel your pain on your afternoon at Home Depot. That sounds terrible :( I hope you don’t freeze in the meantime as things get sorted!!! Oooo, that sounds incredibly festive- the cranberry and pink peppercorn combo. Sorry to hear about the coconut spill out. That must’ve been really frustrating! The freezer is definitely a good idea. Also, sometimes if your oven is not hot enough the oil/butter will ooze before the cookies can take shape. This has happened to me before! 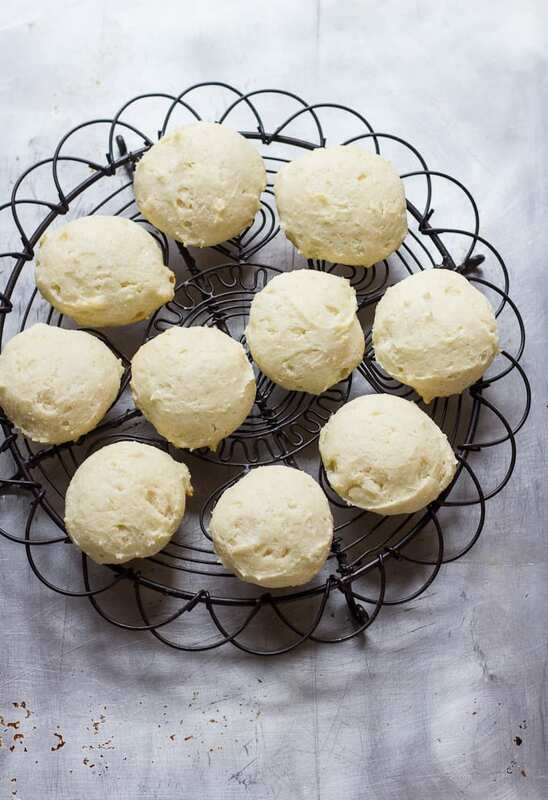 Your ricotta cookies sound wonderful and will have to try baking them. My favorite cookie at Christmas is a decorated sugar cookie which I sandwich with a lemon and vanilla buttercream. Where do I find Fiori di Sicilia? would it be in the baking section of an Italian market? Hi Diane! That sounds fabulous- lemon and vanilla buttercream! Yum. I bet they look beautiful as well. I’ve just amended the recipe (**above) to include where to buy Fiori di Sicilia extract. I purchased mine online through King Arthur, however you can get it on Amazon, in store at Sur La Table, and Italian specialty shops depending on availability. Haha! This story made me laugh because my husband and I had a similar experience trying to buy a lawnmower this past summer. We got a 16 year old newbie who had probably never mowed the lawn in his life! These cookies are so beautiful! I will have to add them to my Christmas baking roster. I have never has ricotta in a dessert before, but it sounds lovely. Literally, you have picked my two most hated things ever! Home Depot is such a drag…my dad always asks me to go as as a bonding thing, but it’s something of a joke now. Hope you get warm soon! Those cookies look delicious and those dishes are gorgeous! These look lovely – naked or not! Our favorite holiday sweets are Russian tea cakes (homemade) and Panatone (from the box)! I’m the same way, Kelly. I get all claustrophobic, hot, and really it’s just not my thing. Outdoor markets are more my speed. Throw me into Home Depot and I die! It must be all that orange ;) Speaking of, I think you will like the extract. It’s a lovely mix of citrus and vanilla. I use it a lot in muffins too. Right before I ‘dressed’ these guys I snatched a few au naturel. They were just as good. Now we can eat them for breakfast. Hi Emilie! These cookies look SO YUMMY!!! I will try them for sure. I have been following you since you began The Clever Carrot. My husband and I learned about it through your mom whom we are friends with. I get many ideas from your recipes and always enjoy your writings. Thank you so much for your contribution to a healthy living. Hi..can not wait to gather all of the ingredients to make your recipe. My favorite is Butter Pecan crescents. Gosh…I love those beautiful serving pieces! Mincemeat cookies, called “Prize Cookies” on the side of the condensed mincemeat package (None Such brand). My mother made them every Christmas that I can remember. I have changed the recipe to make them a bit healthier but they remain my very favorites. Hi Nickie! Aren’t they pretty? 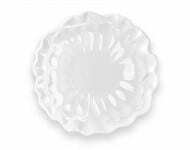 I love the elegant white color and the pretty scalloped edges. The other day I was looking at the back of a Barilla pasta box wondering if anyone ever made the recipes on the side of the package. I think it’s pretty cool that a cooke recipe from your childhood originated that way. I’ve never had Prize Cookies before- I’m intrigued! I rarely use ricotta and had never heard of fiori di sicilia extract but these cookies look so appetising that it looks as though I need to go shopping for ingredients! They look wonderfully Christmassy – just right for December. ugh, god, the home depot store. when i was a kid it was my most dreaded location. something about the hugeness and the cold grey floors and the loud machine noises was just the worst for me. and i am so awkward at texting in public for some reason; it’s like i need stillness and quiet and privacy to even think about communicating via text, so i end up typing things i don’t even remember if i attempt to do it in a store. sounds like a double nightmare for sure. i’m glad you have cookies now. :) they look beautiful! the ricotta part sounds so so good. Don’t even. I actually start to sweat when I go in that store. It’s everything you’ve described and then some! And yes, texting is the same over here- I lose all ability to multi-task. My texts are also riddled with typo’s that auto correct can’t even understand. I impulse send without looking first lol. My favorite holiday cookie is the windmill cookie. I bought some Christmas’s sprinkles on a whim. They’re going to be used in this recipe for sure. Looks delicious and your description had my mouth watering. Thanks so much for stopping by! I hope you enjoy the cookies! These look delicious and so Christmassy! Love using ricotta as an ingredient but haven’t tried cookies like this before…. yet! Hello Anna! Ricotta in dessert is absolutely lovely. It’s very versatile. The flavor lends a subtle creamy sweetness without the tang, like yogurt or sour cream (both which I also love, just for different things). The ricotta will also keep these cookies nice and soft. Enjoy! I despise group texts too, send cookies indeed! ;) Such pretty cookies, they look buttery soft and I love the festive sprinkle touch! These dishes are lovely. Thanks for the giveaway. Thanks Liz! Happy to host this giveaway :) Good luck! Amazing cookies > group texts any day! These look fabulous! I love how light these cookies look. The sprinkles definitely make them cheery! For Hanukkah celebrators you could just use blue and white sprinkles! This looks absolutely delicious. I can almost taste them. Beautiful festive photography as well. Love your recipe. Thanks for the tip about the fioli di Sicilian. Love the platter too! Italian cookies are my absolute favorite. I haven’t had any since my mother-in-law passed away. She made the best, but alzheimer’s disease kept her from sharing the recipe before she died. Hello Brenda, I’m touched this recipe brought back memories of your mother-in-law. They’re one of my favorites as well. I’m sure my cookies won’t top hers, but perhaps they will share some sweet similarities… Thank you for sharing your story with me. Have a very happy holiday! Welcome Melissa! Thank you! I’m with you on the shortbread. Simple, classic and delicious! I love crinkle cookies. They are so festive. Hi Emilie. Something strange happened today with this recipe. And I am sure it’s something I did! I wanted to double the batch so I doubled everything and baked but they came out “cakey” if u knoe what I mean. As if they were Madelines! I didn’t have any white sugar so I used icing. But everything else I followed to the dot- where do u think I went wrong? Thank you. The reason why your cookies were cake-like was due to the icing sugar. This kind of sugar is completely different than granulated sugar and is not an equal substitution. It also has cornstarch in it! It will yield a very different texture altogether. Next time, make sure to use granulated sugar. And if you’d like to double the recipe, I would recommend doing this in 2 separate batches (that’s your best bet)!